The Children’s Rosary has a theme song which was written by Fr. Lawrence Tucker SOLT. This song was written for the Children’s Rosary prayer group movement. We are very grateful for this gift. We have made the sheet music for the song available to Children’s Rosary groups HERE. 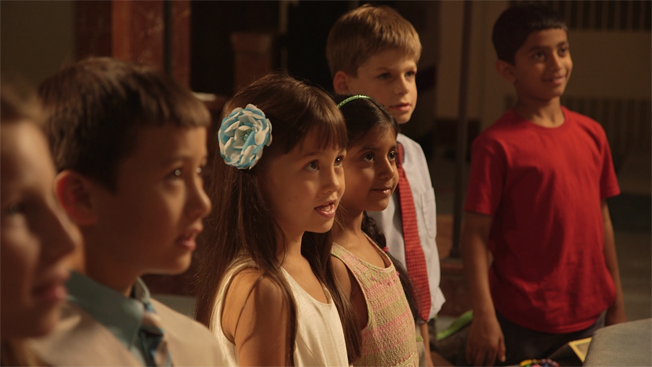 We also have a music video for our theme song featuring members of the Children’s Rosary from our groups around the world. As children so much like to sing we invite Children’s Rosary groups to sing our theme song at the beginning or end of their meetings. We have a CD with the song recorded if you would like to play the song to accompany the children singing in your group. We are aware that many of our Children’s Rosary groups are praying in other languages but we still invite the children to learn our theme song “Rosary Children” in English. In this way it is a universal song that the children can sing all around the world. The music component to the Children’s Rosary meetings is optional. Some groups may want to meet and pray without singing. Others may choose to sing other songs at the beginning or end of their meetings. There is flexibility. Our Children’s Rosary CDs each contain a traditional Marian hymn which also could be played. The “Hail Holy Queen” song included on the Glorious CD is perfect to play during a May Crowing. Likewise, the children singing “At the Cross Her Station Keeping” which appears on our Sorrowful CD can be played if your group would like to lead the Stations of the Cross.